Use this easy tutorial to sew eight half-square triangle units at once, a method that quilters usually call the Magic 8 technique. There are lots of different techniques you can use to make half square triangle units, also commonly referred to as HST units and triangle squares and this method is perfect when you need to sew identical units. What Are Half Square Triangle Units? A half square triangle unit is a patchwork square made up of two right triangles. Each triangle takes up exactly half of the square's interior. No matter what you call them, you'll find that HST units are one of the most popular types of patchwork found in quilts, so it's a good idea to learn more than one method for their construction. Years ago, many of us sewed HST units by securing fabric to a large grid drawn (or printed) on paper, following the sewing lines before cutting the patches apart. The Magic 8 half-square triangle tutorial is basically the same technique, without the extra bulk. We'll use only a small section of the grid, and draw lines directly on fabric, not paper or another material. A favorite HST unit assembly method pairs two squares to create two finished units. It's easy and fast, and perfect for scrap quilts. The Magic 8 method is very similar, but doubles-up the results by sewing the equivalent of four paired squares at the same time. Drawn grids are still popular, and now available commercially, although most are made from long strips rather than a large square or rectangle. You can make your own long grid. Square grids can work nicely for very small HST units, but they become awkward when sewing larger patchwork. When marking a grid directly onto fabric, the larger the grid, the higher likelihood of error. Sure, you can sew two right triangles together to create a triangle square, but individual triangles are stretchy on their long, bias edges. Why bother when quick piecing methods eliminate the need to fool with the bias? Your pattern should tell you the finished size of the HST units. Multiply the finished size by 2. Cut two (contrasting) squares of fabric to match that dimension. HST units finish at 3" x 3"
3" x 2 = 6"
6" + 1-3/4" = 7-3/4"
Cut two contrasting squares, each 7-3/4" x 7-3/4"
Round up and cut two 8" x 8" squares, or squares even a tad larger, and trim-back units to the exact size after assembly. Experiment with scraps to see what works best for your sewing style. Fabric is usually easier to mark (without stretch) when you use sizing or another pressing aid to add stiffness. Use any type of marker that won't bleed into (or rub off onto) fabric, something with a sharp point if possible. Calculate the square size as explained before and cut the two squares you've chosen for your HST units. Draw two diagonal lines on the reverse side of one of the squares, each from one corner to the opposite corner as shown, above left. I tend to mark the lightest square, but keep white markers on hand to use when both squares are relatively dark. Align the squares, right sides together and all edges matched. Secure with pins to keep fabrics from shifting. Sew a seam 1/4" from each side of each line, right image. If you don't have a quarter inch presser foot, mark the lines before sewing. If you are not using an oversize square, sew scant 1/4" seams (slightly narrower than 1/4"). Press the sewn square to set the seams, a step that removes little puckers and makes it easier for fabrics to lie flat later. Slice through both layers of the sewn square through its vertical midpoint. Use the center 'box' created by seams and the original marked lines as a guide, but be sure your rotary ruler is aligned so that its rules are parallel to all outer edges of the drawn square. Left image. You'll have two rectangular sections of the 'block' now (not shown). Use the same technique to slice each in half along its midpoint. Now slice each of the remaining sections apart on the original, drawn lines (right image). Place the eight unopened HST units on your ironing board -- the fabric seams will be pressed towards should be facing up. Press one more time, unopened, to set the seams. Flip the top fabric of one unit back and use your iron to (carefully) press the unit open. Repeat for all HST units. Make additional units as needed for your quilt. 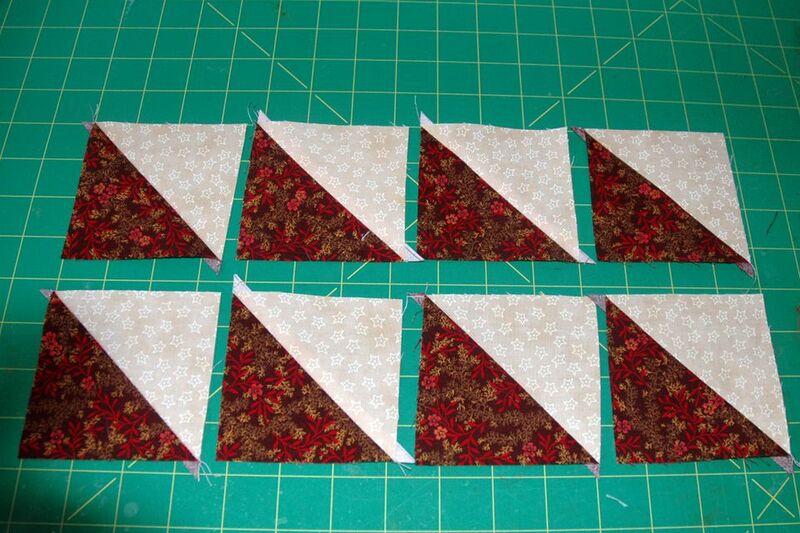 The eight HSTs in the photo have their little 'doglegs' attached – tiny triangles that extend past the seam when patchwork is pressed. Clip them off before use. If you sew large and trim back, the doglegs will come off during the trim.